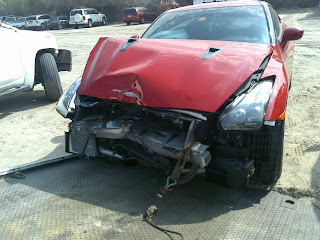 The car had supposedly only been on the road for two weeks.Like most GT-R's it nosed into something. Too much go pedal, not enough stop pedal. The GT-R's 6 piston front 380 mm rotor Brembo brakes are world class, however if the steering wheel gasket needs adjustment, nothing can prevent accidents like this.